Happy June! I do love the long hours of daylight, warmer temps, green hills, and fly fishing in a raft going down river. Too bad it can't be June all year! to be involved in the quilt industry. I already plan to be at our cabin for the last 2 weeks in June for vacation. My sister from Texas will be here for one of those weeks and then we are off to Billings for my nieces wedding July 1st. It seems like we can for years without going to a wedding and this summer we have four to attend! Loren even gets to officiate two of them! I am looking forward to a long, ice tea sipping, sitting out on the porch, reading a book, kind of summer. I need to get some stitching done and time in on the sewing machine also. Our classes usually begin at 10:00 unless noted otherwise. Join us in the classroom and bring your hand work along. We love seeing what each other is doing and sharing ideas. It might be a great way to get that quilt bound without any distractions! We will continue working on our "On the Horizon" BOM. This is the last month and will be starting a new BOM next month. Stay tuned for details! LaRee will help you make this wonky star block and stripes pot holder. It has a pocket at each end so you can slip you hands inside to hold casseroles or baking pans. It makes a great hot pad to put in the center of the table too! Make and take just in time to celebrate Flag Day! Pot Holders for all Seasons (book-$14.99) required. This Mock Cathedral Window is so much easier than it looks and so much fun. Sharon will show the fast technique that includes quilt as you go and no binding needed! You can get as creative as you want with color choices. This is an open group for anyone who wants to learn Toni's method of foundation piecing using pattern ease. 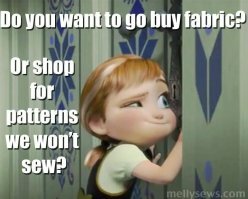 She has printed foundations for a variety of patterns including her own original patterns! You must purchase each pattern and an additional charge for her printed foundations is separate. Toni will once again teach the Crystal quilts that are pre-cut by laser and kitted by Hoffman fabrics. 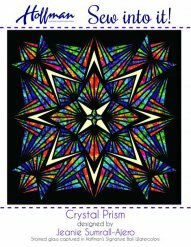 We have several kits to choose from including the newest one Crystal Prism. This quilt is definitely a show stopper! Extra class dates may be required. Last year we ran four Tuesdays in a row. That can be determined by the class. Kit price is $198.00. Row by Row Experience - On the Go! With the theme being On the Go, our favorite place to go and just happen to live in is Montana! Our row points the way and has pre-fused laser cut words included in the kit. You can purchase the kit or pick up a free pattern. Our license plate matches the sentiment! We had another idea for a row so we decided to make another one. This bear is at a cross road and has to decide which way he wants to go. There is no wrong choice! The cute bear was drawn and painted by our own Kim Van De Riet! This row will be available for purchase as a kit only and will include the bear and signs printed on Printed Treasures fabric. You add fusible web and cut out the designs! Here's to hitting the open road to see where it takes you. Stopping at the quilt shops along the way will make the journey all the better!